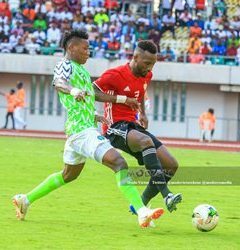 The sudden withdrawal of Bordeaux winger Samuel Kalu from the Super Eagles squad for the Africa Cup of Nations qualifier against Seychelles and international friendly with Egypt had raised a few eyebrows because he played for his club against Monaco on March 9. And speculation that he withdrew from the Nigeria squad for no cogent reason was fueled when Bordeaux announced their 19-man roster for the Ligue 1 match vs Rennes without providing an explanation as to why he was omitted from the squad as it's usually the norm. Super Eagles Media Officer Toyin Ibitoye informed allnigeriasoccer.com that Kalu was nursing an injury and Bordeaux coach Paulo Sousa confirmed as much in the post-match conference on Sunday, adding that the recent kidnap of the player's mother was the main reason for his omission vs Rennes. Speaking to reporters, Sousa said : ''Kalu is suffering from a minor muscle contracture which prevented him from participating in the game. Kalu has earned five caps for Nigeria, scoring one goal, since he made his international debut in an Africa Cup of Nations qualifier against Seychelles in September 2018.